I knew that a beautiful piece of furniture was hiding beneath all of those scratches and orangy stain. After sanding it down, I stained it with two coats of an espresso finish and then covered it with two coats of polyurethane. 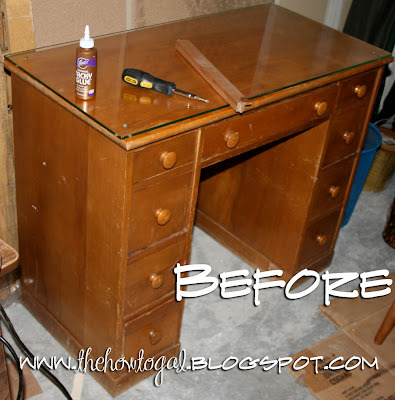 For a complete tutorial on sanding and refinishing wood furniture, visit one of my very first posts as the How-To Gal HERE. Final touches of crystal knobs and floral drawer liners completed the project- a true Cinderella story. Isn't she a beauty!?! I can't stop looking at my fabulous "new" desk. Now all I need is some great art to hang above it! I love your desk! The crystal knobs are great, and the drawer liner is like a secret little surprise. This is so great. 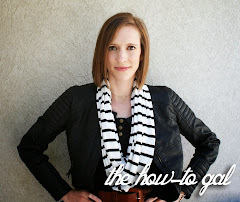 And of course you may link back to my cape tutorial, I would love that! Thank you! That looks great and I just love the espresso finish! My favorite part though is the new knobs. They add a great touch! this is gorgeous! My favorite thing that you've done so far! The dark finish makes such a difference Love the knobs..
Those crystal knobs just finish the whole thing off beautifully. What a stunning heirloom you have created! Looks beautiful! Love the knobs!!! Wonderful look. The glass knobs really do add a touch of class. I could use a little piece like that at my house! 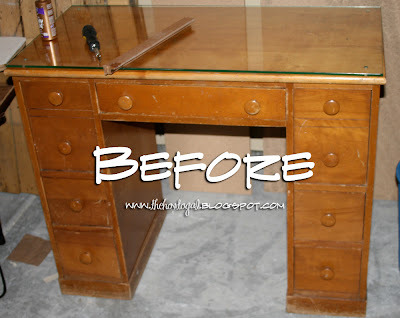 Of course I found you through A Soft Place to Land, and I love what you did to the desk! The stain looks great, especially with the knobs. 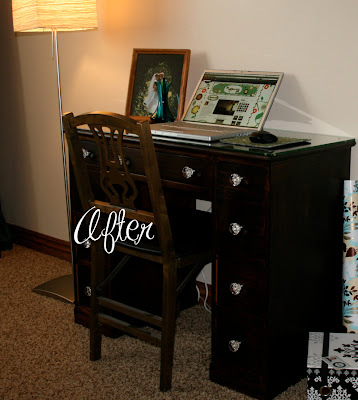 The contact paper in the drawers is a cute touch, too. Great job! You did a outstanding job on this piece...love the hardware!! Hope you have a FUN week. It looks so pretty. I love the hardware you chose too. adds a nice touch! You did a great job on the desk!! 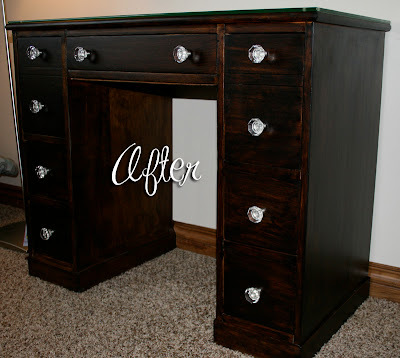 It looks so pretty with the darker color, and the crystal knobs just "make" the desk. You did a wonderful job!! The crystal knobs really make it! It looks beautiful! I love the dark color and the glass knob... be still my heart! It looks great with it's new color and crystal knobs! Winner winner chicken dinner!!!!! That is right up my alley!!!! I know how much more work it is to stain than to paint - it really paid off here! The desk is beautiful. You did a great job - your grandparents would both be proud! Great! The knobs and liner were the perfect girly touches to go along with the sleek black. I love the knobs - they just accent the beautiful work that you did. I'm new to your blog from Kimba's party & love your work... I'll be following you.